A strong core is believed to be essential in swimming. 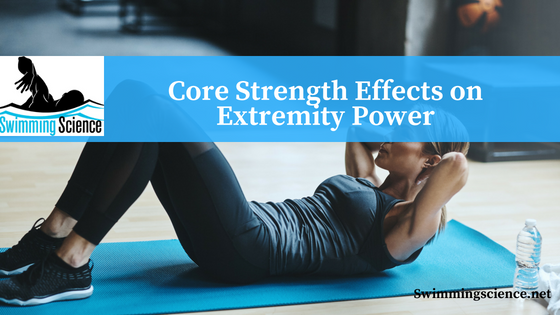 Theories suggest the core helps connect the upper and low body and a strong core efficiently transfers forces through the extremities. Moreover, the endurance of the core is important for prevention of injury. Despite popular belief, there is minimal research supporting the notion of a strong core important for athletic success. One reason for this research gap is the core is often tested in static positions, instead of dynamic movements seen in sport. Shinkle et al. Sought to develop a function field test to assess the role of the core musculature and its impact on sports performance and to develop a functional test to determine how well the core can transfer forces from the lower to the upper extremity. dynamic reverse (DyR), dynamic Left (DyL), dynamic right (DyRi), and a push press for power. These values were associated with 1RM squat, 1RM bench press, countermovement vertical jump (CMJ), 40-yard dash (40 yds), and a pro-agility run (PrA). Twenty-five NCAA division 1 football players were tested. Significant correlations were identified between the static medicine ball throws and the performance variables. StR correlated with CMJ, 40 yds, and PrA. StL correlated with bench, CMJ, 40 yd, and PrA. StRi correlated with bench, 40 yd, and PrA. The dynamic throws demonstrated few correlations, but the push press correlated moderately with 1RM squat, 1RM bench, CJM, and PrA. Once again, the core provides a stable base for a transference of force. The static throws correlated at least moderately with their corresponding dynamic throws. In this study, low correlation between athletic performance and the forward throw suggest the rectus abdominus has little to do with athletic performance. Also, this study concludes the lack of correlation with the reverse throw suggests that the erector spinae is not significant in core function. The core is typically strengthened in static positions, despite the dynamic functional role of this musculature. Symmetrical dynamic core strength is suggested in this study to correlate with athletic movements. More research is required to validate these throwing tests with athletic performance on land and in the water. In swimming the lack of a stable surface for force production questions the relevance of this study for swimmers. More research is necessary on the core in swimmers, especially in field tests. Dr. Jan Prins discusses the role of body roll to serve as a foundation for propulsion in swimming in the ASCA Swimming Science Journal back in 2007. Contact him for an archived copy. power in the extremities. J Strength Cond Res. 2012 Feb;26(2):373-80.